Unique Moments Photography captured this image at hidden beach which is part of Titlow Park on the Tacoma west facing beach waterfront area. Hidden beach is a true hidden gem. Its a west facing beach with a nice sandy beach access area and it has an unlimited view of the west skyline for Washington and Puget sound areas. Does not get any better for photography needs. You have to walk to the beach which is only about a 1/2 mile walk. The trail is paved until the end and then its an EASY dirt path to the water. Low tide is the best time to go as you get a lot more beach to use for your efforts. This image is one of our favorites for the 2017-2018 wedding season. We had an awesome sunset and its the first wedding that we ever covered where our bride wore a red dress. Everything about this image works especially with the awesome sunset we had for this wedding. 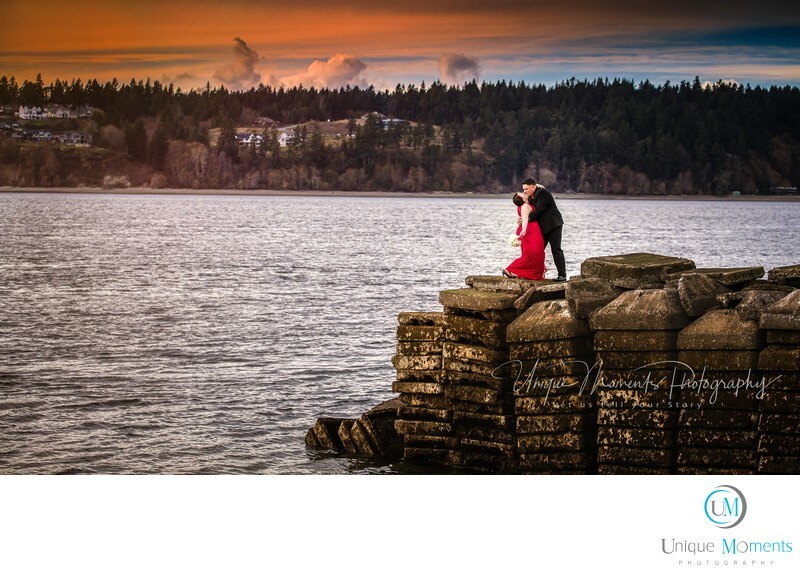 If your a Tacoma Gig Harbor wedding photographer, put Hidden beach on your map. Your clients will love the results. Image captured from a 03-24-2018 wedding. Only Real clients. Only Real weddings are presented by Unique moments Photography. This is not a styled photo shoot.